I can’t quite find a good enough adjective to describe THE TRANSCRIPTIONIST. Quaint? Maybe. That could mean “charm; oddly picturesque”. It’s a shorter book (just crossing 200 pages) that feels simple, but it’s not. There are so many nuances that make it difficult to pinpoint. For instance, on one hand, Lena, the protagonist, works in a soon-to-be extinct job in an old part of a cutting-edge, top of the line news magazine. She has a casual encounter with a blind lady who has a fascination with lions. Yet, despite the talk of lions, there is also a focus on pigeons—they are small, free of burden, and totally in contrast of the powerful counterpart lion. Amy Rowland, the author, also mixes in the much varied news stories from around the world: from the violent and near-obscene, to the mundane and obscure. I suppose that would lend toward the adjective of contrasting. On the other hand, there are the similarities. Both ladies have other peoples’ words flow through them. Both have literary backings: from Ray Bradbury’s THE VELDT, to the scrivener for Chaucer. There’s foreshadowing, if you want to call it that, from a palm reading, “the world goes by my cage, but no one sees me…that roar which lies on the other side of silence.” Or better, from the included quote of Montaigne, “When did we write so much as since our dissensions began? When did the Romans write so much as in the time of their downfall?” I suppose that would lend toward the adjective of comparison of beauty. But what it boils down to is finding our true selves. As the writing testifies, “listening doesn’t make us disappear. 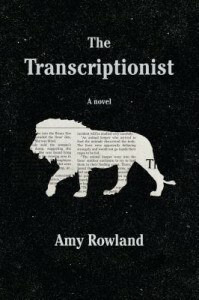 It just helps us recognize our absurdity, our humanity.” And almost as a testimony to the author’s own life, first as a transcriber, an editor, and now an author, “I don’t know, but it will be better. I’m tired of the secondhand life.” There is something to be said for the uniqueness of the created work. So, what we have is a simply beautiful book about the lives of two seemingly opposite ladies with a very similar defining purpose. Each finding purpose in two distinct ways; one still one the journey. Thanks to Algonquin Books for sending this book to me for review.